What Will the Ever-Expanding Green Movement Bring in 2018? From record improvements and cultural relevance in 2017, what will 2018 bring to the green movement? The worst kept secret in home building is that the green movement gained even more steam in 2017. And where it’s going in 2018 could be even more interesting. Not just for the technology side of it, but because the culture of the movement itself is gaining steam. Since LEED Certification started releasing annual numbers in 2010, the number of certified homes rose to an all-time high in 2017. In seven years the number has doubled, from 32,000 to 65,000, and it’ll continue to top itself in 2018. Just take a look at what builders like CEO Gene Myers’ Thrive Homes are doing in Denver. Thrive was a Grand Winner at four consecutive Housing Innovation Awards ceremonies thanks to their Zero Energy Ready homes. In emergencies, they can run on their own stored power for a limited amount of time. The public interest in green homes will only continue to grow as we reach into the new year. A 2017 National Association of Home Builders survey proved that builders are flocking to the new market trend. In the study, at least one third of single family and multifamily builders who were surveyed said that green building is a “significant portion of their overall activity.” That means that more than 60 percent of their overall building portfolios are devoted to green homes. And 30 percent of those builders surveyed said that more than 90 percent of their portfolio is green. Historically, the traditional barrier for builders to go green like they are today was cost. But that’s melting away as market advances lower prices. The same NAHB report found that builders are less concerned with the start-up costs involved with building green homes than ever before. The reason is simple; buyers are increasingly willing to pay a little extra up front for a green home in order to rake in the monetary benefits of lower energy costs over time. That means more green building, more investment, and more potential buyers than ever. A lot of this is because the technology involved is evolving so quickly. The most exciting area for technological growth in 2018 is in solar technology. In 2016, the U.S. hit its one millionth solar-powered home, and in 2017 Project Sunroof declared four in five homes in the U.S. has the potential to be powered by solar energy. The cost-effectiveness is hard to miss, too. In 2017, solar-powered homeowners in the U.S. saved on average around $900 off their energy bill. Over a 20-year period, that works out to around $18,000, and the savings are only increasing as the technology improves. In 2018, expect more solar innovation to hit the market. With more efficient and cost effective models becoming available every year, more change is on the way, and fast. So the technology is coming along nicely. But the real success of the green building movement, and the weathervane pointing us into 2018, has been in its increasing cultural relevance. Why did more companies build green homes in 2017 than ever before? The same reason companies like Whole Foods have grown so popular; there’s a moral imperative attached to it. All company cultures want to be “off the grid” cultures in the sense that long-term reliability and self-sufficiency is best for the culture itself as well as the bottom line. As companies, we want to store up our energy and prepare for the worst, so if something does happen we can be stronger than ever on the other side. If we’re honest, all CEOs and leaders want their companies to be dependent on their own power, not dependent on the whims of circumstance. How much more secure and certain would employees feel in that situation as well? If you know your job is safe even when the market tanks, you’ll be unleashed to drive more profit. And that’s what fostering an “off the grid” culture can do for you. This is the true value of where the green building movement is as we enter 2018. People are seeing in bigger and bigger numbers the certainty a bank of solar panels on your roof can provide. They’re seeing how an electric generator can feed into that “off the grid” type of culture. Or how rainwater harvesting and smart thermostats are contributing to the sense of long-term reliability without sacrificing short-term convenience. Whether you’re making a home capable of sustaining itself or a work culture that can power through shortages, going “off the grid” has never looked better for 2018. 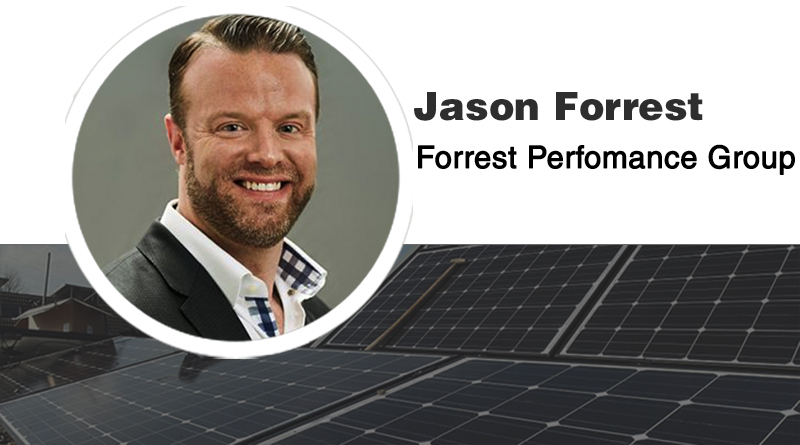 Jason Forrest is the CEO and Chief Culture Officer at Forrest Performance Group in Fort Worth, Texas. He may be reached at www.fpg.com.